Dwarf galaxies are, as the name implies, the smallest of the galaxies. In our local neighborhood around the Milky Way, they range in size from the small Segue 2, with a mass of about 5 x 105 solar masses, to the Large Magellanic Cloud (LMC), with a total mass of about 1010 solar masses. 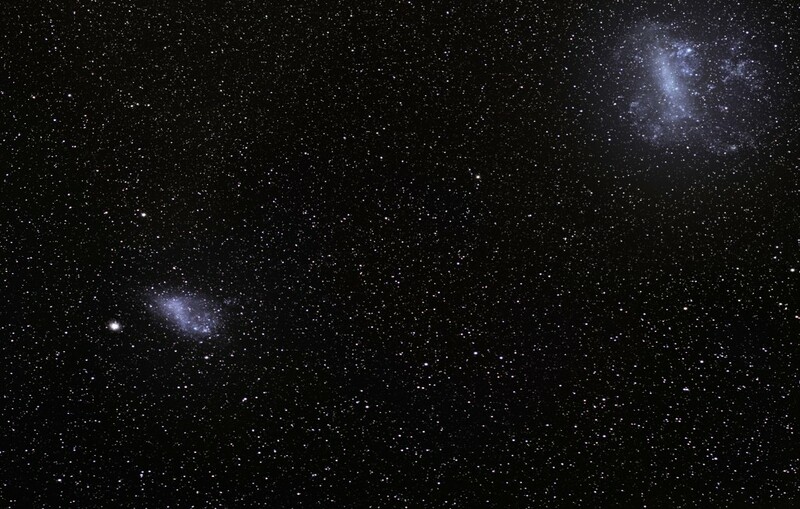 Figure 1 shows an image of the LMC, and its companion, the Small Magellanic Cloud. Although we have a fairly good understanding of galaxy formation and evolution for massive galaxies (think the Milky Way and bigger), our understanding of these smallest galaxies is not nearly as complete. This is partly because these smaller, less luminous galaxies are challenging to observe at distances larger than a few megaparsecs (Mpc) from our Milky Way (the nearest massive galaxy to us, Andromeda, is about 0.77 Mpc away). Within that distance, we can detect them by resolving their stars. But for far away dwarf galaxies, an improved detection method to increase the number of observed dwarf galaxies would go a long way towards improving what we know of these small galaxies. The authors of today’s astrobite propose a new method relying on novae and supernovae explosions to detect dwarf galaxies farther away than what is currently possible. Novae and supernovae are among the brightest astronomical events that we can observe. Novae occur in binary star pairs containing a white dwarf and a larger companion star. As gas accretes from the larger star onto the white dwarf, the hydrogen on the surface of the white dwarf eventually hits a critical mass, nuclear burning occurs, and a nova is produced. This is not to be confused with a Type 1a supernova, however, where the total mass of the white dwarf hits a critical limit (1.4 solar masses), and explodes. Both of these events are very luminous, but short lived. Detecting them is often a matter of getting lucky (looking in the right direction at the right time). The authors propose using current and ongoing surveys designed to detect these transient events to identify new and otherwise unobservable dwarf galaxies. (see this related astrobite discussing even another way to detect dwarf galaxies.) The authors use one of these, the planned Large Synoptic Survey Telescope (LSST), as a baseline to judge what will be observable in the near future. Figure 2 illustrates the difficulty in directly detecting dwarf galaxies. Shown is the surface brightness (left) and radius (right) of all known nearby dwarf galaxies as a function of the absolute visual magnitude of the dwarf galaxies (translated to stellar mass at the top axis). Most dwarf galaxies have been detected by resolving their individual stars. However, this can only be done out to a few Mpc; beyond this, they can only be detected if they are above a certain brightness. The dashed line in the left plot shows this limit for the faintest object the LSST can detect. In other words, anything below the dashed line can only be detected if it is within a few Mpc of us. Therefore there may be many galaxies that we simply cannot (yet) observe. In the right hand plot, the dashed lines give the farthest distance galaxies of the indicated size (0.1 kpc and 1.0 kpc) can be resolved by LSST (20 and 200 Mpc away respectively). The authors argue that ongoing and upcoming surveys looking for transient events, like the LSST, will observe many novae and supernovae associated with undiscovered dwarf galaxies. In order to predict the likelihood of this occurring, and the types dwarf galaxies we may discover, the authors construct a model to predict the rate of novae and supernovae in dwarf galaxies. The authors take what we know about the distribution of dwarf galaxies, how their star formation rates and histories vary as a function of their stellar masses, and make some assumptions about how often novae, Type 1a supernovae, and Type II supernovae occur as a function of the star formation rate of the galaxy. Combining these factors, and noting the significant uncertainties in some of their assumptions, the authors predict rates of novae and supernova in dwarf galaxies as a function of the dwarf galaxy’s stellar mass. This is shown in Figure 3 for two different assumptions on how the stellar mass of a dwarf galaxy scales with the dark matter mass of that galaxy. Shown is the supernova and nova rates in dwarf galaxies within a certain distance (horizontal axis) from us. The three lines in each show these rates for galaxies with stellar masses less than 108, 106, and 105 solar masses. The dotted (leftmost) portions of each line show distances galaxies of that mass can be spatially resolved (i.e. where we don’t need this new method), solid shows unresolved but a brightness greater than the limit given in Figure 2, and dashed are currently unobservable. Due in part to the “cadence” of the LSST (the length of the camera exposures and the frequency with which a given region is re-observed during the survey) there are limits as to which of these galaxies can be observed with the new method. The authors predict that galaxies which fall in the gray and blue boxes will be detectable by the LSST via novae and supernovae respectively. With their calculations, the authors conclude that the upcoming LSST should be able to detect 10-100 novae from dwarf galaxies with stellar masses of 105-106 solar masses every year out to about 30 Mpc, and 100-10,000 supernova in these galaxies every year. With this, the LSST can be used to detect many more dwarf galaxies than currently known. Even though they are so faint, once we have discovered where these dwarf galaxies lie, we can use focused follow up observations to observe them directly. With an increased sample of known dwarf galaxies stretching far from our Local Group of galaxies, we can better understand how galaxies form and evolve on the smallest scales. One thing I don’t understand here is once you observe the SN, how do you know it was exploded in a dwarf Galaxy and not in a normal galaxy that is very far away? I was wondering the same thing about how do we know its a dwarf galaxy, could it be that we look at doppler shifts in the nova’s spectrum to find the recession speed of the galaxy? Perhaps there is a recession speed characteristic of these dwarf galaxies. I am wondering the same as shmuel bialy: how can you match an observed supernovae with the size of the galaxy it lives in? Also – how long will these type of novae last before we can start observing the dwarf galaxy where they were found? Interesting post! Are there any other telescopes that will be able to detect supernovae in dwarf galaxes in addition to the LSST? Is the relationship between mass and novae/supernovae rates much different between dwarf and regular galaxies? Is the only distinction between dwarf and “normal” galaxies the size? I’m wondering whether or not we would expect novas/supernovas to be more or less common in dwarf vs normal galaxies? What sorts of follow up observations will we be able to do on dwarf galaxies once their locations are better known? I’ve heard there are problems associated with the cold dark matter paradigm and observations of dwarf galaxies. Could these be resolved if more dwarf galaxies are detected by this method? Do we have an idea of what percentage of all galaxies are dwarf galaxies?